“You know the rules.” The alien stated in a monotone. “Excellent. This should be entertaining.” The screen flickered and altered to show the view of a forest, coordinates flashing across the screen and strange text scrolled down one side. Lexx turned to Chel, frowning. He had no choice. “You want to understand, Chel .. then watch … and learn.” He motioned to the screen, then turned to retrieve his coat. Zeta trotted after him, thinking he was going down with him. “No, Zeta. Stay.” Lexx commanded flatly, still limping from where Zeta had bit him. That was going to slow him down. 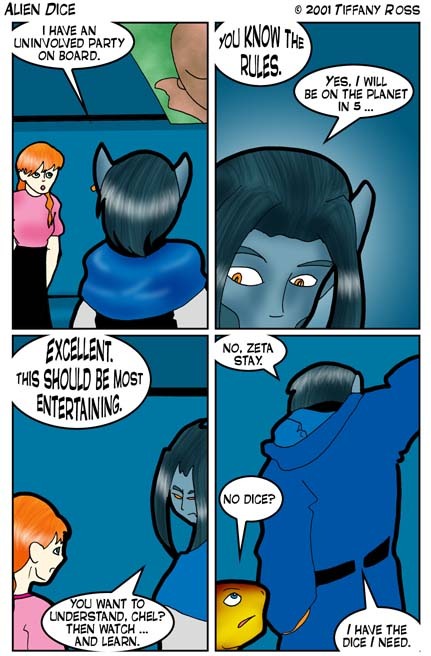 “No dice?” Zeta cocked his head curiously. “I have the dice I need.” Lexx pulled on his coat, but didn’t bother with buttoning it.